Dunerbrew: Brewing: It's like creating music. Brewing: It's like creating music. Some days I want to pick up the guitar, start strumming and plucking, and create a beautiful song. How is that working for me? Sometimes I get lucky, but it usually doesn't work very well. You see, there are several strings (6 actually) on the guitar, and while each will work by itself, they are meant to work in conjunction with each other. Each string needs to be tuned to it's own special note, and then played in a certain sequence. To play a song, keeping the sequence in order is essential. Then once understood, that same sequence can be played over and over, producing the same basic results...that song. It's not overly difficult, but you can't just pick up a guitar and expect to become Eric Clapton overnight. Similarly, some days I want to throw some ingredients together, toss in some hot water to the mash, go through the process, tossing in some hops here and there, and whammo!, produce great beer. Works great, right? Uh... maybe. But how much water? At what temperature? How much grain, and what kind? Hops? Which ones and for how long should the be in the boiling water? How will I cool it when done? How will I transfer and store it? There are several notes to be played to create this music of beer. Is it difficult? Twinkle Twinkle Little Star is simple. Eruption isn't quite so simple. Beer kits are simple, following recipes and instructions take some more thought. Creating a beer from scratch can be a bit more difficult too (at least as first). Eddie Van Halen can play Eruption in his sleep. Where to begin: With the guitar, you may be well served to know the strings are EADGBE. With brewing, you will need to know grains, hops, water, temperature, yeast, volumes, your equipment, etc. 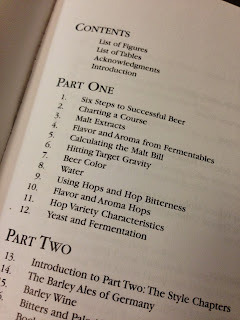 I started the brewing hobby with reading. The bible of homebrew was first, "The Complete Joy Of Homebrewing, by Charlie Papazian. Next was a similar how-to book, simply called "How To Brew", by John Palmer. These books show you how to tune the guitar, what a fret is, an octave, strumming procedures, etc. All essential items for getting underway. The next book was "Designing Great Beers", by Ray Daniels. This is a little more technical, and will explain the theories of chord progression, keys, sharps, flats, and all those other technical type items. The first time through the book, I was quick to become lost in the details. I found myself skimming through the calculations simply because I didn't understand them. The second pass had me with a spreadsheet file in front of me, where I duplicated the formulas, and strung them together, giving me sheet music (if you will) for the recipe and brewing process. Sound difficult? It is time consuming to learn and then to apply that knowledge. But it will make you a better brewer. I will go through the Designing Great Beers book again. I plan to better gauge the particulars of the equipment, etc. I believe that the way it is done now can be improved upon, resulting in better beer, less wondering, and ultimately more satisfaction with the process. Sound nerdy? I'm OK with that. Brewing, is really very similar to creating music. A few select notes, in a repetitive sequence, with some tone and timing involved, and the end result is something people can enjoy.